Fellow blogger Ben McAleer wrote a great piece this week about the new manager, whoever he may be, needing a great deal of patience (read it here). I couldn't agree more. We as football fans are fickle at the best of times and being thrown into such a state of uncertainty following Harry's departure this will only be amplified greatly. Even those of us that were happy to see Redknapp leave Spurs will admit to having had our doubts over it truly was the best move for the Club. From a personal point of view, the longer we remain without a manager, the more I wonder what chairman Daniel Levy has planned for us. I am convinced however, despite moments of weakness, that we'll be better off in the long run without Harry. That phrase; long term, leads me back to Ben's article. Whoever comes in and takes over, whether it be in total control or under the stewardship of a Director of Football, will have a long term strategy that will hopefully see Tottenham compete at the top during their tenure. But this could come at a price. I'm not expecting, unlike some of you, that we will drop out of contention at the top of the league and return to our glory days of mid table obscurity, but we could finish outside of the Champions League places for at least one season as the new man attempts to stamp his authority on the team and implement his tactical approach on the team. We can't see this as failure though, we must see this as part of the plan, building for the future. Calling for patience is all well and good, but a lot of fans are prone to knee-jerk reactions. But if the development is clear to see, I would like to think our supporters will back the manager and not jump on every little mistake and call for his head if there is a poor run of results. I can't imagine seeing as poor a run as we did from February onwards this season again any time soon. There seems to be three main candidates for the post. David Moyes and Laurent Blanc could be in line for the job, but are unlikely to want to work under a D.O.F. and would want total control of the team and recruitment. This goes against Levy's apparent desire to return to the continental model and employ someone to oversee the transfer side of the Club. Which leads me to believe that ex-Chelsea and Porto boss Andre Villas-Boas is favourite. Some media outlets, particularly in Europe, are leading us to believe that a deal is already in place, but won't become official until July 1st due to an agreement with Chelsea as part of his dismissal in March. The talk of our players not being keen on AVB's return to London makes me laugh. Luka Modric being one of the names mentioned, is it not ironic that he was desperate to work with him a year ago, but not now. Correct me if I'm wrong, but Chelsea weren't that far behind us when Mr Abramovich sacked him. With, in my opinion, a vastly inferior squad being carried by a few headline names. His record at Porto was fantastic and with the backing of our board, the players and a good working relationship with a Director of Football, if we have one, he could transform us into a fantastic, competitive side. I've heard arguments for Moyes and Blanc, neither which inspire me with much optimism or excitement. Blanc has a good record in France, and with his international side. Personally, I think he will remain in his current role, a win tonight against Spain would add backing to his cause though. Moyes is a talented manager. He's worked wonders at Everton on a limited budget and kept them competitive in an unforgiving league. To me, he's the safe choice. Which leads me back to the quote that inspired this blog. 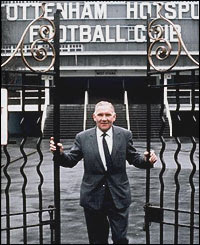 Bill Nicholson only ever wanted this Club to succeed. To be willing to gamble and reap the awards. Moyes isn't a gamble. We'll probably stay around our current position. I don't think he'll take us to another level. AVB has the talent, tactical nous and most of all the desire to succeed that could push us on to that next level. His 'failure' at Chelsea means he has a point to prove, he didn't become a bad manager over night. So, Mr Levy and the board, set your sights high, gamble, and bring in a man to build a legacy at our great Club.